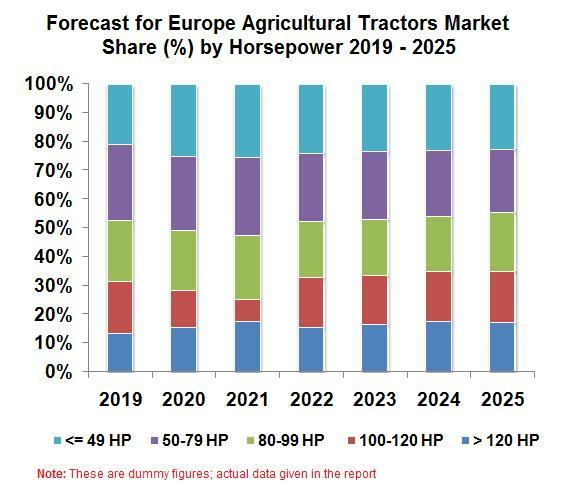 (MENAFN - GetNews) Renub Research report titled 'Europe Agriculture Equipment Market by Segments & Sub-Segments [Tractor (Horsepower: > 120 hp, 100-120 hp, 80-99 hp, 50-79 hp, <= 49="" hp),="" harvesting="" equipment="" for="" general="" crops="" (cereal="" and="" root="" crop:="" self-propelled="" forage,="" combine),="" other="" harvesting="" (balers,="" others),="" haymaking="" equipment="" (mounted="" or="" trailed="" mowers,="" others)="" tillage="" equipment="" (scarifiers="" and="" cultivators,="" ploughs,="" others),seeding,="" planting="" and="" fertilizing="" equip=""> Across the globe, Europe agricultural equipment market is one of the most developed agricultural markets. The major growth factors of Europe agriculture equipments are increase in production output by increasing level of mechanization and optimized supply chain. Problem like labor shortage and ageing population of farmers will further boost the growth of agriculture equipment market in the forecast period. All these mentioned reasons, thereby increases the usage of agriculture equipment, thus driving the growth of Europe Agriculture Market. Europe agriculture equipment market will surpass US$ 67 Billion by the end of year 2025. The report provides the market share of 12 major agriculture equipments segments of Europe. Agriculture segments covered in the report are as follows: Tractor, Harvesting Equipment for General Crops, Other Harvesting, Haymaking Equipment, Tillage Equipment, Seeding, Planting and Fertilizing Equipment, Irrigation and Crop Protection Equipment, Agri Trailers, Livestock Equipment, Dairy Equipment, Garden Machinery & Others. In this report, we have fragmented the harvester machines into five parts; Self-propelled forage harvesters market, Root crop harvesters market, Combine harvesters market, Balers market and other harvesting machines market (including grape harvesters). Haymaking Equipment Market:There are basically two type's haymaking equipment; Mounted or trailed mowers and Other Haymaking Equipment all of this haymaking equipment market are covered in the report. Tillage Equipment Market:In this report, tillage equipment market is divided into four parts Scarifiers and cultivators market, Harrows (tooth, disc) market, Ploughs market and Other tillage equipment market. In this report, we have segmented the irrigation and crop protection equipment into four parts; Sprayers, mounted or trailed market, other crop protection sprayers market, Portable sprayers with or without motor market and Mechanical irrigation systems market. In this chapter, we have done in-depth analysis of European irrigation and crop protection equipment market. Livestock Equipment Market:In this Chapter, we have categorized livestock equipment into three parts; Poultry breeding equipment, Feed preparation equipment and other livestock equipment. This chapter constitutes historical figures of livestock equipment as well as forecast figure to give complete scenario past, current and future trends. Garden Machinery:In this report, Garden Equipment is divided into four section; Lawn mowers or mowers market, Chainsaws market, Rototillers or rotovators, market and Forestry equipment market. Renub Research is a Market Research and Consulting Company. We have more than 10 years of experience especially in international Business-to-Business Researches, Surveys, and Consulting. We provide a wide range of business research solutions that help companies in making better business decisions. Our clients rely on our market analysis and data to make informed knowledgeable decisions. Our pertinent analysis helps consultants, bankers, and executives to make informed and correct decisions.